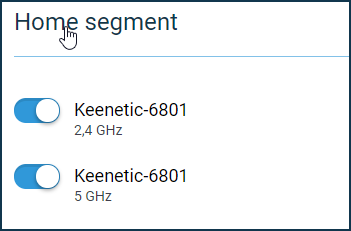 Connecting to a web interface of Keenetic you will see the starting page 'System monitor'. It contains the main information panels (their set depends on the capabilities of the model and a selection of components of the built-in operating system of the router) - 'Internet', 'Home segment', 'Guest segment', 'Applications', 'Network Ports', 'About the system'. The 'USB-disks and printers' panel is present only in the interface of models with USB ports (except Keenetic 4G). 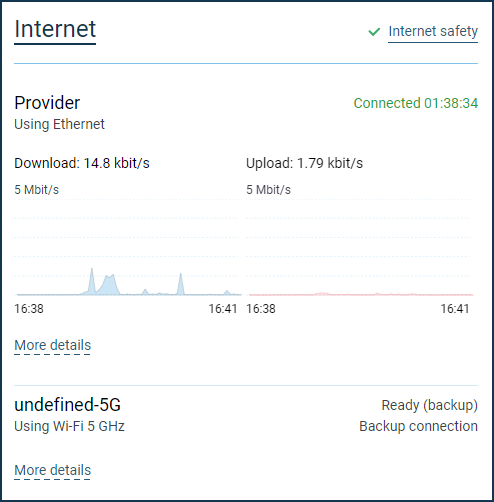 On this panel you can view the status of your Internet connection, the session duration, and the current data rates. NOTE: Important! The graph shows the current receiving and transmitting speeds for the last 3 minutes. This is not the maximum throughput rate of your internet channel. In the upper right corner there is an LED of Internet safety service usage. If there is a backup connection configured, you will also see the status and information about this connection. To display additional information about the connection, click on 'More details'. 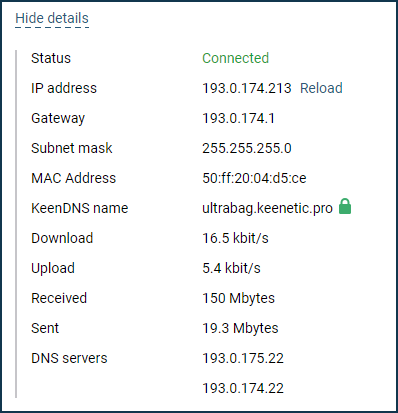 For example, you can see the IP address on the external (WAN) interface of the device, the registered KeenDNS name, and the total amount of received and sent data. 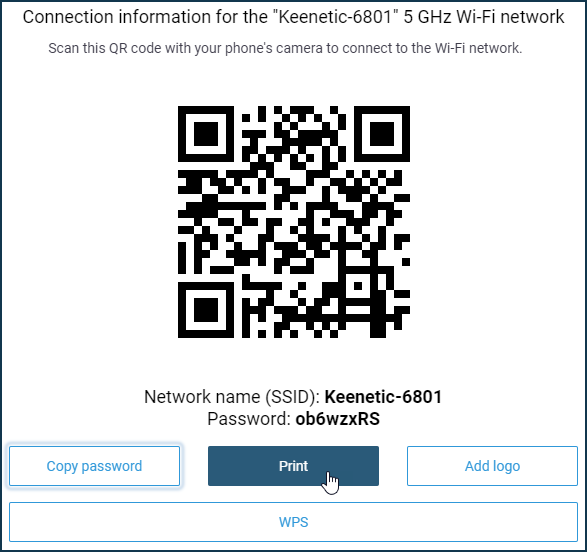 In this panel you can see the number of devices connected to your Keenetic through cable and Wi-Fi. Clicking on the panel title you will be redirected to the corresponding configuration page. You can quickly turn on/off the Wi-Fi network using the switch. 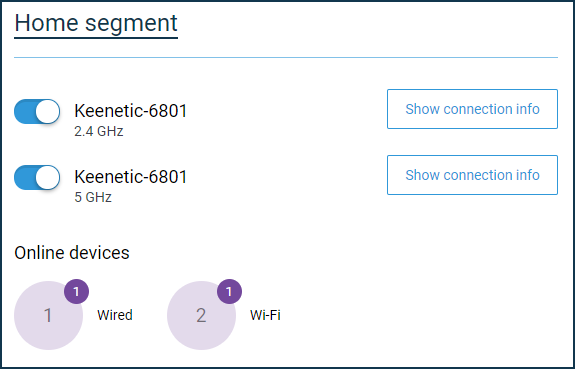 Clicking on the icon with the number of connected devices will take you to the 'Device lists' page, where you can view home devices information, such as the current speed, or register your devices. This panel provides the same information as the 'Home segment', but only for the Guest network segment. 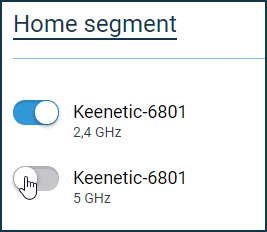 This panel is only displayed on models with a USB port (and except Keenetic 4G). It shows the available USB storage space and occupied capacity, for the printer - the name and connection status. Clicking on the device icon will take you to the 'Applications' page. 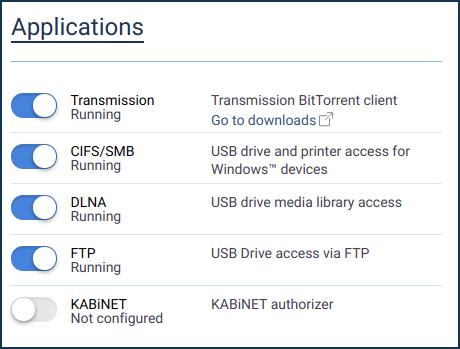 This panel provides a list of installed applications (their set depends on the capabilities of the model and a selection of components of the built-in operating system of the router). 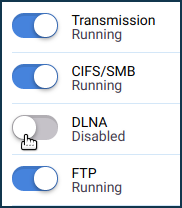 Switches are available to quickly enable/disable applications. By clicking on the description, you can quickly go to the configuration page of the corresponding application. Here you can see the port status of the built-in network switch, the speed of the cable connection and duplex mode. If a port is configured in a certain way (for connecting to ISP, IPTV Set-top box, IP phone), a special icon will be displayed on this port. 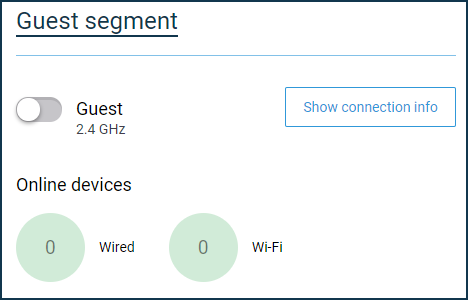 By clicking on the name of the panel you will be redirected to the 'My networks and Wi-Fi' page (Home segment, Guest segment). 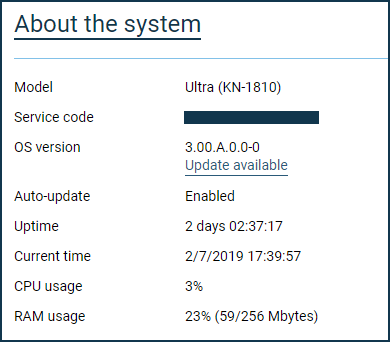 This panel shows information about the router's model, its service code, KeeneticOS version, auto-update status, Keenetic's operating time, current time (synchronized with a time server automatically when connected to the Internet), CPU load, available and occupied memory.